Not many men are remembered by the Church as 'Great' and even fewer women have that distinction. 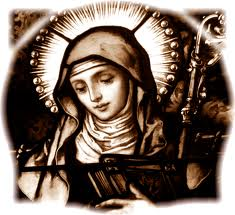 I recently saw a prayer attributed to St. Gertrude, and first the name drew my attention (a very dear childhood friend was a German lady named Gertrude) and then I was intrigued by her title of 'the Great', so I decided to learn more about her. She had the gifts and the zeal of a scholar, and so devoted herself to study with great ardour. She was passionate about the science of education, and about music, art, and literature. At 26 she received her first vision, and realized her worldly studies were vain and empty. Immediately, she "cultivated the highest spirituality" (New Advent Catholic Encyclopedia) and focused her studies on higher things. Though a supremely gifted intellect, she was able to explain theological matters with clarity and simplicity. This became an apostolate, in which she worked to popularize the truth of faith. The best known of her works is her Spiritual Exercises, dealing with baptismal grace and preparation for death. She had intimate conversations with Our Lord, and with Mary. Jesus told her, "Do not fear. I will save you and set you free." and revealed His great desire to grant mercy to souls and to reward the least good act. (ewtn.com) 'Revelations of Saint Gertrude' is a book containing her mystical experiences. Among them were ecstasies and raptures. She asked that there would be no external marks of His favour (stigmata) on her, in deference to the comfort of those around her. Though she became Abbess, she had the disposition of a servant, and "was solicitous in attending to the necessities of everyone." (ewtn.com) This strikes me as a remarkable quality, considering her great intellect. She didn't get lost in her head, but was always aware and considerate of others. She gave the work of her mind to the Church, and used her knowledge and insights for the help of those who sought her counsel, whether for theological or personal matters. This is where her femininity shines: she was concerned for the individual, not just thoughts and ideas. She had the gift of miracles and prophecy. 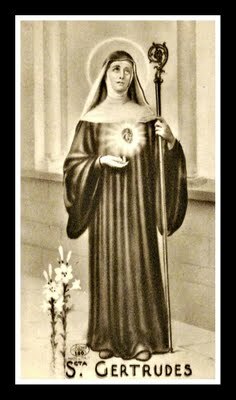 She was devoted to the Sacred Heart. Through watching, fasting, abstinence, perfect obedience, and the constant denial of her own will, she was able to submit completely to the Holy Will of God. Many saints recommended the prayers and the writings of St. Gertrude, including Philip Neri and St. Frances de Sales. Teresa of Avila chose her as a model and guide. St. Gertrude had a yearning for the perfection of souls consecrated to God, and a tender sympathy for the souls in purgatory. Now we invoke her for souls in purgatory and for 'living sinners'. Eternal Father, I offer You the most precious blood of Your divine Son, Jesus, in union with the masses said throughout the world today, for all the holy souls in purgatory, for sinners everywhere, for sinners in the universal Church, and those in my own home, and within my family. Amen.